9:am #3 N5XO Is your Coax Charging you a TAX? The San Antonio Radio Fiesta is scheduled for Saturday, January 13, 2018 at the Schertz Civic Center, 1400 Schertz Pkwy, Schertz, Texas. The Schertz Civic Center offers more floor space and tables in the exhibit hall. With multiple programs scheduled, plus the winter meeting of the Texas VHF Society, we believe our attendance will increase. VE testing starts at noon, just a few blocks down the street at the Schertz Public Library. Advance RSVP is highly recommended to hamtest@gmail.com. Bring a original & a copy of any current / previous ham license (if upgrading), your photo ID, and $15 cash for the session. No credit cards accepted. Contact Pat AD5BR at the above email address for more info. HOURS: 8:00 am to 2:00 pm on Saturday. Saturday – Set up starting at 6:30 am with the doors opening at 8 am. Also, If you want to join, or renew your membership, with the San Antonio Radio Club, you can save $3 by paying at the Radio Fiesta. Look for the SARC table near the front entrance. Dues: $12 for entire family by Jan 14 ($15 after). Sign up every ham in your family for one low price! Cheapest club rates in town (compared with those groups who charge annual dues)! For additional information on our great programs and schedule of events, please view our website at http://w5sc.org. The San Antonio Radio Fiesta is scheduled for Saturday, January 9, 2016 at the Schertz Civic Center, 1400 Schertz Pkwy, Schertz, Texas. As everyone knows the weather was not in our favor last year, but we had a good turnout considering. The Schertz Civic Center offers more floor space and tables in the exhibit hall. We will have a meeting area that will seat approximately 180 people, plus a meeting area for VE testing. With four programs scheduled plus the winter meeting of the Texas VHF Society (hopefully), we believe our attendance will increase. The Amateur Radio Fiesta will be Saturday, January 9, 2016. Also, If you want to join, or renew your membership, with the San Antonio Radio Club, you can save $3 by paying at the Radio Fiesta. Look for the SARC table near the front entrance. Dues: $12 for entire family by Jan 9 ($15 after). Sign up every ham in your family for one low price! Cheapest club rates in town (compared with those groups who charge annual dues)! For additional information on our great programs and schedule of events, please view our PDF Flyer at http://w5sc.org/2016%20webpage%20flyer%20B.pdf. No, it isn’t a spelling error, it was plagiarized from WD5GWT to hopefully grab your attention to start going through your piles of ham stuff and pulling out unused antennas of any sort, superseded ARRL publications, hf. vhf and uhf rigs, meters, ‘scopes, computers, solder stations and such like. Location & Time: You will want to bring those items Saturday morning to GVARC’s swap meet at 0900 Saturday morning, February 14th, 2015, at the New Braunfels Fire Training Facility, 1311 Industrial Drive here in New Braunfels. GVARC had hoped to use Granzin’s overflow parking lot diagonally across from the main entrance, but it was discovered this morning that the lot now belongs to a local church. GVARC requests that you bring only ham related stuff. That is to say, no kittens, puppies, sheep or Avon products. GVARC’s expectation is the honesty typically associated among hams. If you say something works, it should. If you don’t know, say so. Here’s how is going to happen. Everyone is invited to join us for GVARC breakfast at Granzin BBQ Restaurant (660 West San Antonio Street, in New Braunfels, TX 78130) at 0730 or so Saturday, and then promptly at 0845, we will saddle up and ride over to parking lot where K5GST and his VE team administer GVARC ham exams. The Hamfest normally being held in Corpus Christi, hosted by the South Texas Amateur Radio Club has stepped it up quite a few very large notches! 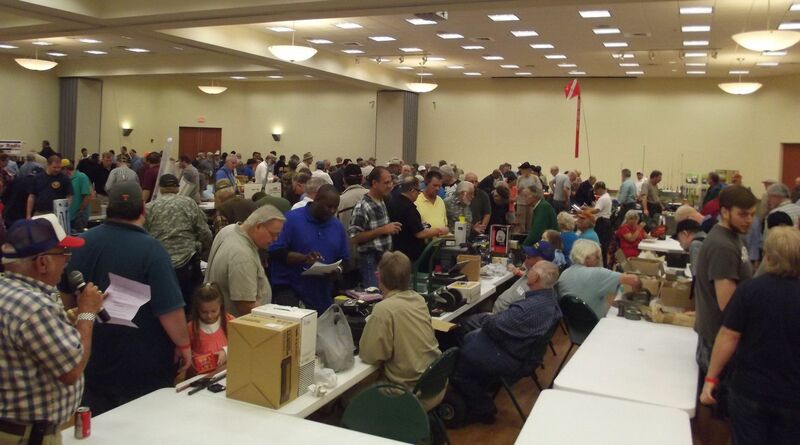 It is well beyond our normal, “club event – Hamfest”, and is now a much larger entity !! This year, we are in a new facility just north of Corpus Christ in Aransas Pass, Texas. Our new location offers us over 8,000 square feet, over 100+ tables, a conference room and room to grow should we suddenly require it. Along with the usual hosting of new vendors, flea market, tailgating, VE test session and forums, we are offering a Friday Night Antenna Build, an extensive offering of door prizes, a Silent Auction with consignments accepted, (maybe a Saturday Night gathering event somewhere) and a Sunday Tour of the USS Lexington !! And for the hams with Young Ladies by their side, we will also have some offerings, along with all the activities along the South Texas Coast, YOUR VACATION DESTINATION !! Visit the http://southtexashamfest.org details and schedules. Check back often as we are working quickly to get everything listed on the site, as there is more to this event than meets the eye. We are in a much, much larger location this year!!! This Hamfest will be the biggest yet in South Texas. We have over 8000 square feet of Exhibit Space and over 100+ tables available !! – Closes October 26th – Don’t miss out!! NEW FOR THIS YEAR : SILENT AUCTION !! I’d like to personally invite you to attend the 48th Annual Central States VHF Conference. If you’ve ever wondered about what it takes to get on the VHF/UHF and Microwave bands, this is an excellent conference to attend. You’ll want to attend our VHF-101 introductory class. This year’s conference theme is QRO, or making high power on the VHF and up bands. We have an impressive list of speakers supporting this topic and many other topics including oscillator design, antenna construction, station design and construction. – Our banquet speaker is Jimmy Treybig, W6JKV. Jimmy has done over SEVENTY six and two-meter DXpeditions to over 50 countries. He’ll be sharing his perspectives on family and DXpeditions. The conference will feature noise figure and gain measurement, sun noise measurement, prizes, a rover-row and dish-bowl, a swap fest and an excellent lineup of vendors. The family program starts off on Thursday evening with a chartered boat tour including a meet-and-greet with a catered BBQ dinner and an opportunity to watch one of the largest colonies of Mexican Free-Tailed bats emerge for their evening dinner run. Even though you live here in Austin, you may not have had an opportunity to take one of these boat trips and having done one last year, I must say they are a lot of fun and not to be missed! Please note: the boat trip is filling up fast so if you are interested in this trip, register ASAP! On Friday, the ladies program ventures out to Fredericksburg for shopping, wine tasting and to soak up the culture and then on Saturday on to the Natural Bridge Caverns for a tour of the underground caves and on to the San Marcos Premium Outlets for more shopping. It’s important to register early so we can have adequate transportation for the family events. JULY 2nd is the deadline to get conference discounted hotel rooms. If you have any questions, please feel free to drop us an email and we’ll get right back to you (austin2014@n5ac.com). 73’s and see you in Austin! Be sure to join us at the 48th Annual CSVHF Conference on July 24-27 in Austin, TX. Visit www.csvhfs.org for more information. HamEXPO is March 29, 2014! Your opportunity to sell and buy product or distribute and receive information to about 1,200 people on a Saturday morning. All indoor spaces have free electricity. There are a limited number of spaces against the wall. Only 50 miles north of Austin! Just 130 miles north of San Antonio! 140 miles south of Dallas / Ft. Worth! 165 miles northwest of Houston! Admission fee for the public is $5.00 per person at the door (children under 12 get in free). Includes one free raffle ticket (a $2.00 value). The DEADLINE for registering online is 10:00AM, Tuesday, March 25, 2014. Today is the 2014 San Antonio Radio Fiesta. Talk-in will be on the SARO repeater 146.94 (-, 179.9) by W5SC with N5NTG as the net control operator for the morning. Location is 1400 Schertz Parkway, Schertz, Texas, at the Schertz City Community Center. Take Exit 174B off of IH-35 and turn back towards the SE on Schertz Parkway (that’s to your right if coming from San Antonio). Admission is now $10 at the door. All indoor flea market tables have been sold out! Some tail gating spots were left, as of Friday night. !! !Radio Fiesta 2014 is coming to Schertz Civic Center!!! January 11, 2014 … Mark your calendars! This Flier/Registration Form, in PDF format, contains full details about today’s activities. Visit www.w5sc.org for full details about the schedules, etc. The St. Patrick’s Day Hamfest is hosted by the Midland Amateur Radio Club. All the information about the hamfest will be posted on their website as soon as it’s available. In addition, our traditional flier will be mailed out in January. If you’ve registered in the last three years you should receive a flier. Take advantage of our early bird pre-registration special through January 10! Check out the details on the pre-registration page. The 2nd Annual South Central Texas Meet, Greet and Swap Fest, sponsored by the Big Texas Radio website, was held today, June 1, 2013, from 8am-1pm, at the Cibolo City Park, 608 W FM-78, Cibolo, TX 78108. The park is also known as Niemietz Park. Free Admission, Free Food, Free Door Prizes. About 150 hams showed up for this free event. We don’t know how they do it, or how they fund it, but the Hams from Big Texas Radio website are the sponsors. They don’t charge admission nor table fees. They do provide free sodas, water, and a full BBQ Catered Meal, plus lots of high dollar door prizes, including the Grand Prize this year, a brand new Kenwood TS-480SAT HF Radio, still in it’s original box. Other door prizes include a Baofeng UV-3R Dual Band Handheld 2m and 70cm radio, Weller 40 watt soldering station wlc100, donations from GrumpyShop.net and other hams, and multiple $20 cash door prizes and a top cash prize of $103. You had to be present to win any prizes, and the drawing was held around noon time. We've set up other local Hams as Contributing Editors to post new topics for discussion, local club news, ham news, etc. Contact me via phone at 210-771-7075, or via email if you would like to become a contributor. Location Change for April 27th VE Session Ham Tests. Not at Great Northwest! Contact us at 210-771-7075 or send your questions to e-mail info@sanantoniohams.org.